Tall grass fluttering in the wind, the smell of hay, horses, and fresh rain. Walking around the ranch, pictures kept popping into my mind. I saw a bride in cowboy boots with multiple strands of necklaces around her neck. A unique bouquet in one hand and leading a horse with the other. Authentic, raw, yet elegant and beautiful. This type of visual bombardment was nothing new to me. Ideas constantly flicker in my head, but this time I was determined to make it happen. Shades of lilac and mint green, the rough texture of burlap contrasting with the intricacy of lace, delicate flowers and worn leather. The wedding of a cattle baron's daughter to the son of a neighboring rancher. For better or worse, through flash floods and droughts, the shoot went down and was published! Pictures and tips for achieving the same feel are coming soon, but until then, here's a sneak peek into my head! And you pulled it off brilliantly! Congratulations! 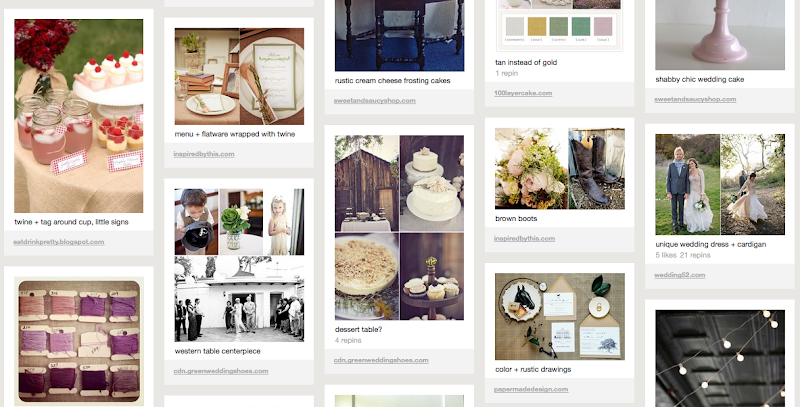 Love the idea of posting a Pinterest inspiration board on the blog!